Abstract—Members of the CAP Nighthawk Composite Squadron are always looking for ways to enhance our capabilities for air and ground search mission. We observed that many SAR organizations such as the Mountain Rescue Association, Texas EquuSearch, and many professional public safety SAR teams have already employed drones in successful operations. Anticipating that CAP Search and rescue operations can greatly benefit from the use of autonomous UAVs to survey the environment and collect evidence about the position of a missing person or aircraft we undertook a joint training operation with the North Texas Drone Users Group (NTDUG) to determine if the use of drones can improve our performance in these tasks. This paper will discuss the results of our exercise. Introduction – CAP Search and rescue operations are often characterized by a similar set of constraints: there has been a delay, sometimes significant, between the times an aircraft or person has been reported missing or overdue and CAP is activated to conduct a search, time is critical and further delay may result in loss of life. There are times when weather does not permit the use of CAP manned aircraft but does allow for the deployment of Ground Teams. We began with the premise that drones can provide support to CAP search operations and reduce the time to locate a target. We looked at the fact that drones are quick to deploy, can be autonomously operated, and can be deployed when manned CAP aircraft cannot. 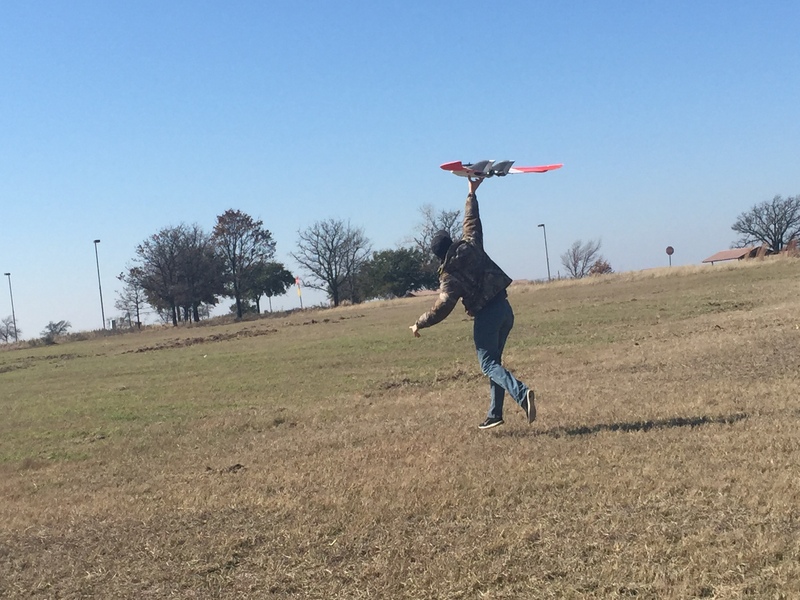 For this exercise we collaborated with the North Texas Drone Users Group (NTDUG). NTDUG is a group of approximately 540 amateur and professional drone users committed to promoting the use of flying robots for civilian, recreational, agricultural, search and rescue as well as hobby purposes. NTDUG is a member of the Drone User Group Network, an association of community groups that promotes the use of civilian drone technology for the benefit of humanity. Within NTDUG is a smaller group of professionals who have a specific interest in the using drones for SAR. They routinely conduct their own SAR competitions within the NTDUG community. For this exercise six members of NTDUG brought two fixed wing drones customized from kits, two commercial off the shelf (COTS) multirotors, and one custom flying platform used in movie cinematography. NTDUG has been in existence for three years and has developed a set of checklists, safety guidelines and standard operating procedures that mirror the current and proposed FAA regulations on the hobby use of drones. Essentially they operate their aircraft within line of sight of the ground station and below 500’ AGL. The Equipment – The equipment brought by NTDUG consisted of two fixed wing drones, two COTS multirotors, and one custom flying platform. 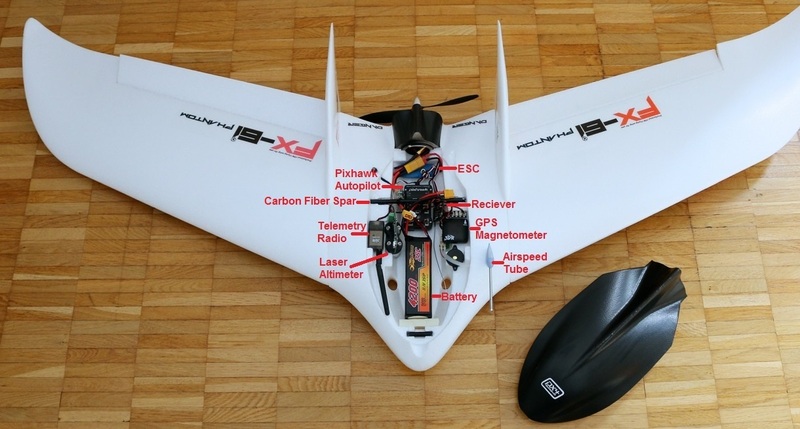 The two fixed wing drones were both Phantom FPV Flying Wing kits. The basic airframe is purchased for around $100 and outfitted by the user with motor, propeller(s), GPS, autopilot, camera, etc. The total finished cost for these two aircraft including carrying cases was approximately $5000 each. The primary fixed wing drone used was fitted with a Cannon PowerShot S100 12 megapixel camera. This is a relatively inexpensive, approximately $200, camera with a built in GPS. The SD card was set to boot up the camera when turned on and to automatically take a photo every three (3) seconds. Other boot up parameters may be set but the NTDUG members have found this configuration the most universally effective for SAR. This drone would be launched and autonomously fly it’s search pattern while being monitored at the ground station. It would take a photo every 3 seconds stored on the camera’s SD card. After returning to the start the photos would be off loaded to a laptop for analysis. If needed a second battery and second SD card would be installed and the drone re-launched to continue taking photos while the first set is analyzed. The second fixed wing drone was fitted with a cellular phone system that allowed both the operation of the drone through a cellular network and the uploading of photos to a cloud server as they were taken in addition to storing them on the camera’s SD card. This would allow photo analysis to begin back at a mission base while the search flight was in progress. Unfortunately, like manned aircraft, this drone experienced a mechanical problem and was unable to fly. The duration of a single battery is forty-five minutes to one hour depending upon conditions aloft. NTDUG has set 30 knots as the maximum wind limit and the first day of the exercise the drone recorded 24 knots aloft at 250’ AGL. Battery life is one of the many parameters monitored at the ground station so a drone may be brought back to the launch location before it runs out of power. The two multirotors, also called quadcopters, used were both DJI Phantom 2 and 2 Plus units which are COTS units and may be purchased ready to fly including a backpack case for $800 to $1500. The Phantom 2 is the easiest to use and requires the least amount of training time. NTDUG members stated they could train CAP personnel to safely and effectively operate a DJI Phantom in about one hour. It can provide both real time live feed back to the ground station as well as recording. The quadcopters are limited in both range from the ground station and time of flight, typically 15 minutes with special builds up to 30 minutes. 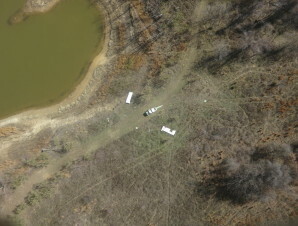 There primary use would be spot checking an area of interest identified in the larger search area covered by a fixed wing drone and/or delivering a radio, first aid supplies, or water to a survivor located in an area inaccessible to CAP Ground Teams while waiting for a higher level rescue team to arrive on scene. We had some hypothetical discussion about the ability to drop a DJI Phantom from a CAP manned aircraft and operate it from the aircraft to deliver a radio, medical supplies, or water to a crash survivor(s) or missing person that was located and where it would be some time before ground personnel could arrive. It is theoretically possible but would require field testing to determine practicality and operational technique. 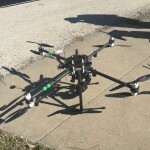 The octocopter flying platform provided by the cinematography group is a custom unit costing approximately $15,000.00. While capable of lifting heavier cameras and IR/thermal cameras it’s duration of flight was very short, approximately 18 minutes. The images provided were excellent but the much less expensive quadcopters provided images more than adequate for SAR use. This unit is best utilized as a call in resource as needed. The first day’s exercise was to search and find a simulated aircraft crash. 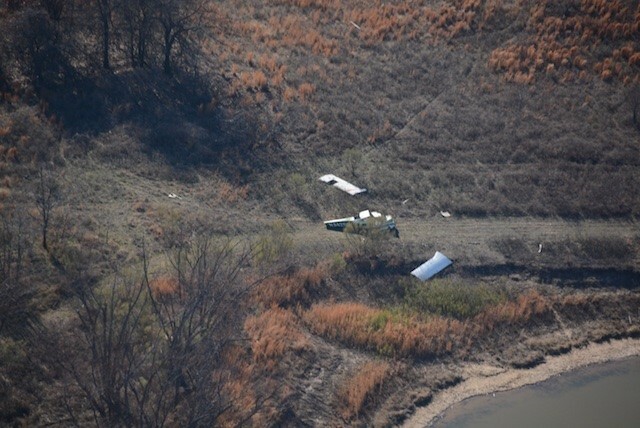 A Cessna 177 Cardinal fuselage, wings, ailerons, and various other crash debris was set in a small open area in a wooded area simulating the pilot attempted to land there and crashed. NTDUG was given a search area ½ square miles with a lat/long of a last known position and a heading of 020 degrees. NTDUG used Mission Planner, a free open source Windows based application, to plan the search mission. 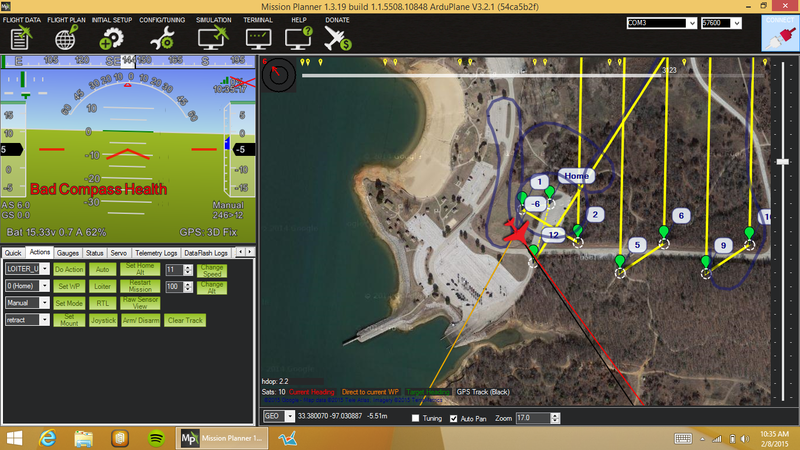 Mission Planner is used both as a mission configuration utility and as a dynamic control ground station for the autonomous drone. With Mission Planner you use a simple point and click on GoogleEarth or other loaded maps to set the outer boundaries of the search area and then the search parameters such as track spacing, search altitude, etc. and it creates a search pattern. The search pattern can be quickly adjusted for direction of flight or outer boundary of the search area. The pattern is then uploaded to the autopilot in the drone. 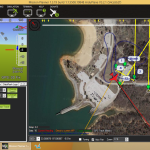 With appropriate telemetry hardware you can monitor the status of the drone while in operation, record telemetry logs (which are also recorded in the autopilot itself), view and analyze the telemetry logs, and operate the drone in first person view (FPV) to make any adjustments from the path flown by the autopilot referred to as “nudging” by the drone operators. It took approximately 15 minutes for NTDUG to plan the sortie which they estimated would take 45 minutes to fly covering 19.11 miles. Once the search sortie was planned and uploaded to the drone autopilot the NTDUG ground crew followed a detailed checklist to prepare the drone for flight. The launch procedure, mission plan, and contingencies were briefed. The fixed wing drones are launched by hand with the launch person making a short run and throwing the drone forward whereupon the autopilot engages and takes the drone to its initial altitude circling over the ground station. Inflight checks are made before the autopilot is activated to begin the search sortie. Following the inflight check the autopilot is signaled from the ground station to climb to search altitude, 200-250’ AGL, and begin flying the search pattern uploaded. On this day the winds at 250’ AGL were 24-28 knots, close the maximum winds NTDUG will fly. 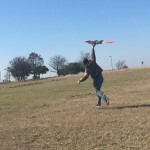 This severely affected battery drain on the upwind legs as the drone tried to maintain the 20 knot ground speed optimal for three seconds a frame photography. The NTDUG ground crew closely monitored power drain and made a decision to return the drone to the start point about halfway through the planned sortie rather than risk running the drone out of battery power. The Phantom FX-61 is has no landing gear and is belly landed and needs about a 100’ grass field for landing. Landing may be accomplished by hand flying or autoland. Once the drone was recovered the SD card was removed and the photographs loaded on two laptops for analysis. Had this been an actual mission the battery would have been replaced with a fully charged unit and a new SD card loaded into the camera and the drone would have picked up the search where it left off while the photo analysis continued on the ground. As the cellular linked drone was unable to fly we could not test the capability of the mission base pulling the photos from a cloud server and conducting analysis at the base. comparison purposes a CAP aircraft took aerial photos of the crash site from 1000’ AGL. The CAP aircraft flew over the crash site at 1000’ AGL at the same time the drone was flying in the area at 200’ AGL. Both pilot and observer reported they could easily see the drone below them and keep it in sight. The visibility of the drone from the CAP aircraft was likely increased due to the orange and white paint scheme on the wings of the drone. In addition to the dispatching the CAP Ground Team we also provided lat/long coordinates to the quadcopter and octocopter operators. They determined a location near the coordinates to launch their drones. 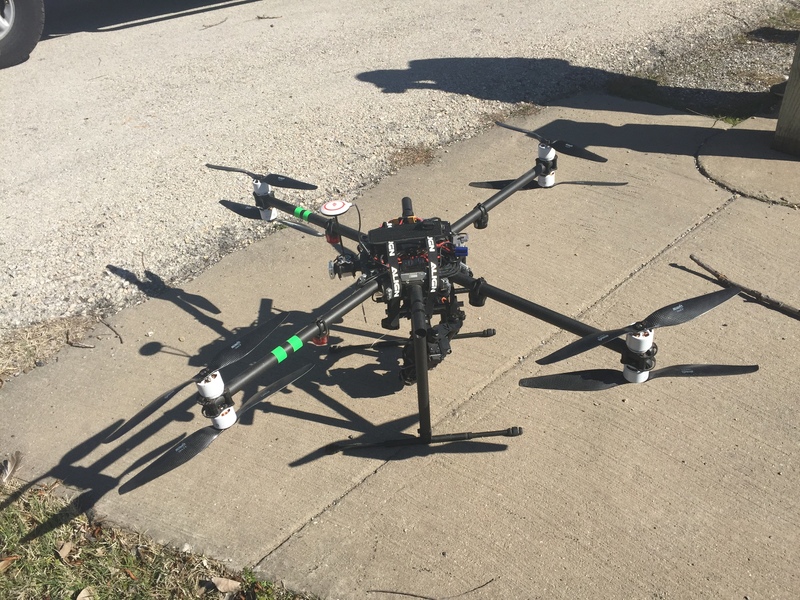 Once on scene they first used the DJI Phantom quadcopter to fly across a small lake and located the crash site within five minutes of launch. The quadcopter was streaming live video back to the ground station as well as recording the images. After recovering the quadcopter at the start point they launched the octocopter flying platform. 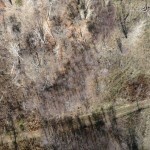 While the images streamed back from the cinematography grade camera carried by the flying platform were excellent, https://vimeo.com/120090548, the video provided by the relatively inexpensive quadcopter was more than adequate for SAR purposes. The second day’s exercise was a more difficult assignment. 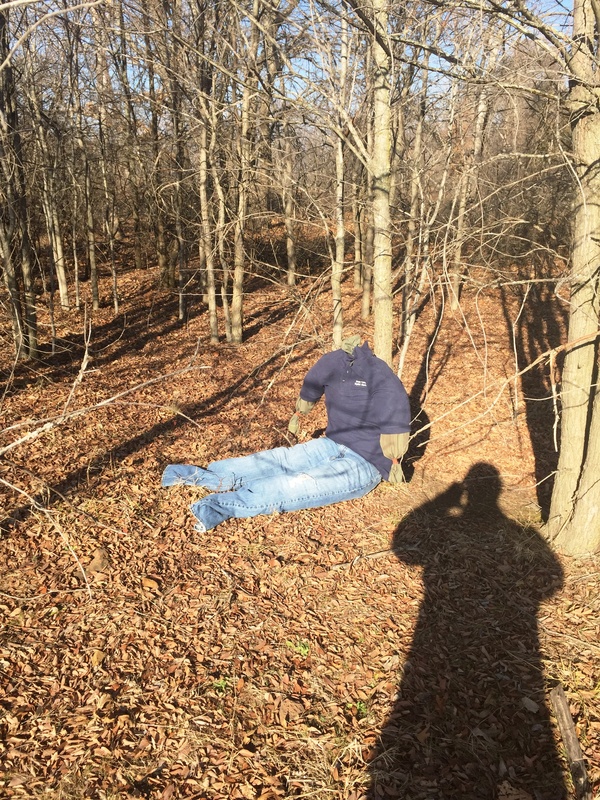 An adult sized mannequin was dressed in a blue shirt and blue jeans and concealed in a wooded area. The NTDUG ground team was given the description and a scenario that a person with Alzheimer was camping with his family and wandered away from their campsite during the night and was presumed lost. NTDUG was given a smaller area to search and prepared their search sortie using Mission Planner as before. They went through their checklists and launched the fixed wing drone as the previous day. Flight conditions were favorable with only 6-8 knot winds at 200’ AGL. The flight was completed initially at 250’ AGL and then the same search area was covered again at 200’ AGL in two different directions. 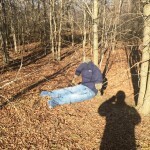 Time elapsed between launch, recovery, and photo analysis identifying the position of the missing person was approximately one and one half hours. A CAP Ground Team received the coordinates by radio and quickly located the simulated victim. In a second part of the missing person exercise the missing person was concealed in a different area and the NTDUG multirotor team taken to a nearby location. 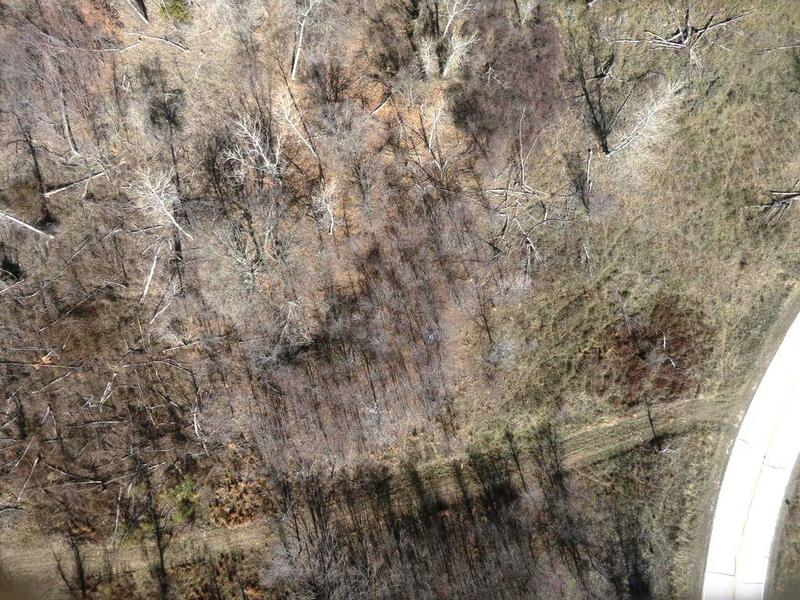 They were told a CAP Ground Team had been assigned to conduct a line search of the nearby wooded area and asked to first search it with their drone. From time of launch, to locating the missing person, to return to start was approximately 3 minutes. The CAP GBD on the scene estimated that it would take approximately one hour to search the same area with a standard CAP Ground Team. The final aspect of our joint exercise with NTDUG was our introduction to Maps Made Easy which is a web application that lets users upload aerial photos, stitch the images and host created maps. With this application NTDUG stitched over 600 images together overlaid on GoogleEarth which allowed us to view the entire search area, scan, zoom in, and identify individual pieces of crash debris and the location coordinates. In addition to the photo in Figure 10 below the final product can be viewed here Denton CAP SAREX 20150207 at Maps Made Easy. Unmanned aerial vehicles (drones) can provide a critical support for CAP search and rescue operations both when manned CAP aircraft are unable to fly and as a tactical search enhancement tool for CAP Ground Teams deployed in areas where a target may be concealed by terrain. Other uses such as delivering a radio or supplies by operation from a manned CAP aircraft require further experimentation. However in order to achieve their full potential, it is necessary to properly account for all the parameters that can affect the flight of the UAVs such as quality of sensory operations (that can depend on the position of the UAVs for instance), energy constraints, environmental hazards and data sharing constraints between UAVs and rescue teams. In our short experiment we learned that fixed wing UAV’s such as the Phantom FX-61 used require significant training and practice in their operation as well as skill in field maintenance as they are subject to mechanical and electrical failures much like manned aircraft. To that end our current thinking would be to call in a group such as NTDUG to support CAP search and rescue missions as needed. We also learned that COTS units such as the DJI Phantom 2 quadcopters are, comparatively, much less expensive and easier to operate and maintain and would make an excellent addition to a CAP Ground Teams tactical capabilities. We will plan further exercises to explore ways to effectively use manned aircraft and drones in an integrated effort to increase the speed and accuracy at which victims in need of help may be located and rescued. As mentioned in the beginning of this report drones are already in use by many professional SAR teams and we would recommend CAP at the National level pursue early adoption of this technology through collaboration and partnerships with organizations such as the North Texas Drone User Group as well as acquisition of inexpensive drone technology to enhance the capabilities of CAP Ground Teams and/or encourage and provide incentives for local units to add this capability to their SAR toolbox.